My Akai AAR-32 stereo set was designed and programmed to tune the regular FM broadcast band, and the old AM MW band from 530 KHz to 1610KHz. But now there are stations above 1610 KHz. In the extended AM band up to 1700 KHz. In an analog tuned radio, getting the extended band is just a matter of re-tweaking the local oscillator and antenna LC circuits capacitor trimmers (usually found attached to the tuning cap frame). Just reduce the capacitance of the osc trimmer while listening for extended band stations. Then trim the antenna circuit for sensitivity. But in a microcontroller controlled digital tuned receiver, this won't be so simple. In my Akai receiver, the microcontroller scans the user front panel pushbutton keys, then sends a sequence of digital values to the Phase Lock Loop (PLL) chip. The Akai uses a TC9125BP PLL chip. This chip has its data and address lines multiplexed together. This data tells the chip by what value to set a divider circuit fed by a reference oscillator. This results in a pulse train that is compared to the analog voltage controlled local oscillator, and adjustments are made automatically to that local oscillator to get it on the desired frequency, namely (station frequency + IF frequency). For more on PLLs, do a web search on phase lock loops, or even go to an old fashioned paper book engineering library. 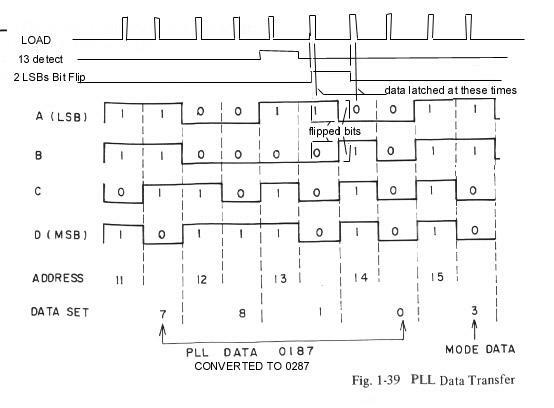 The TC9125BP chip uses binary coded decimal to load the divider registers. As the data/address bus is 4 bits, nibbles are sent and strobed into the chip's registers. Data are numbers (in binary) from 0 to 9. Address make use of invalid binary encoded decimal codes (from 11 to 15). An address is sent first, strobed by the load line, and the next nibble is the data to be loaded into the register (upon the next load strobe). Four pairs of addresses and data are sent, as the decimal representation of the divide value is 4 digits long. See the timing diagram. Note that the spoofing leaks into the next address nibble, but this leakage is ended before the next strobe comes along. So there is no misprogramming done. For the AM band, the value to be loaded is equal to the frequency of the desired radio station plus the IF frequency (in this set, 460KHz). For a station on 660 KHz, it would be (660 + 460)/10 = 112. So the value "0112" would be sent. If we wanted 1660, we would need the value "0212". But the microcontroller was programmed not to ever send this value, as it would make the radio tune outside the old AM band. 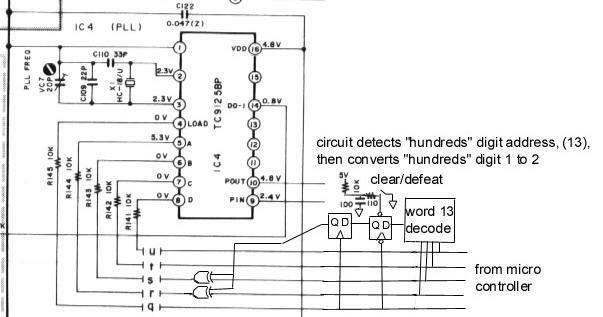 However, we can make a circuit that detects when the "hundreds" digit data is to be sent, and change say a digit 1 into a 2. With this circuit enabled, punch up "660" on the "dial" and the "hundreds" digit modified by our circuit, the PLL chip sees the value "0212" instead of "0112". 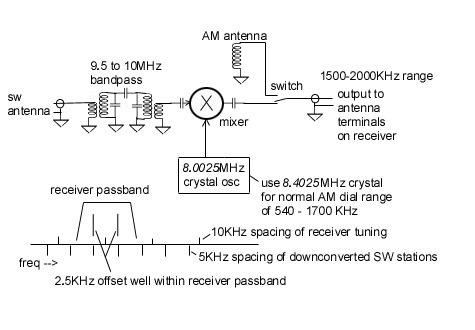 And cause the receiver to actually receive a station at 1660 KHz instead of 660 KHz. This spoofing doesn't stop at 1700 KHz, my receiver could accurately tune up to 2030 KHz (though there are no AM stations up there). This is limited to the range of the controlled analog oscillator. Connecting an indicator to pin 13 (frequency lock in) of the PLL chip will tell if the PLL is locking or not. See diagram for spoofing circuit block diagram. As mentioned above, I was able to tune as high as 2030 KHz and maintain lock. This includes the ham radio 180 meter AM and single sideband (SSB) phone (voice) communications band. I was able to listen to Amateur SSB communications with the Akai. Listening to SSB with an AM receiver can be done by using a second AM radio. Tune the local oscillator of the second AM radio (by tuning to around 1500 on that radio) to "beat" with the SSB signal to produce understandable audio. Leakage of the local oscillator from the second radio into the Akai receiver's antenna will do the trick. This exact description is probably of limited direct application to sets that use the above PLL chip. But the overall concept to be gotten from this web page is that the digital commands from the microcontroller in your set can be intercepted and "spoofed" to cause the PLL to tune beyond the original design range. You'll need documentation of the commands your set uses, which may be provided by the service manual. Reprogramming the microcontroller is possible in theory, but would rarely be practical. I used the excess tuning range (1700-2000 KHz) to receive the output of a shortwave block downconverter. One thing to notice is that shortwave broadcast station frequencies are spaced at 5KHz intervals, and the Akai set tunes only every 10KHz. The downconverter local oscillator causes a 2500Hz offset on the downconverted shortwave stations. This is within the Akai receiver's IF bandpass filter, so you can listen to stations at x.xx0 MHz and the other stations at x.xx5 MHz. Of course, this means that you won't be able to separate some stations 5KHz apart. See diagram below. This sort of local oscillator 2500Hz offset scheme could also be used to downconvert your favorite SW band down to the normal AM range of a PLL digitally tuned car radio. I used the Ramsey shortwave downconverter board, and modified the input filter to allow signals between 9.5 to 10MHz thru, and to stop signals above and below. This is like the RF section of a superheterodyne radio set. The Akai receiver acts as a tunable IF. The 9.5 to 10MHz filter stops images from 6 to 6.5MHz from getting thru.